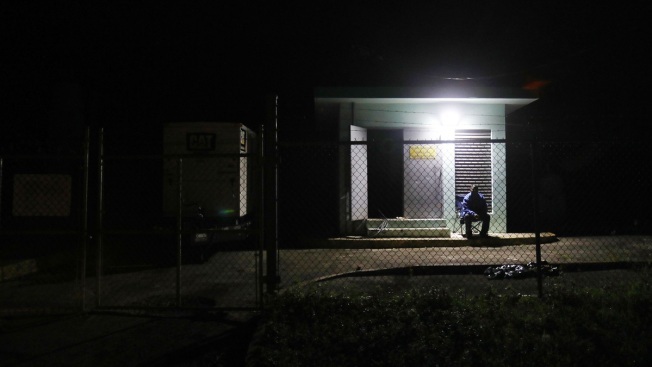 In this December 25, 3017 file photo, a security guard keeps watch next to a large generator in Loiza, Puerto Rico. Most of the neighborhood remains without electricity. A federal judge on Monday approved a $300 million loan for Puerto Rico's power company that officials say will help keep the troubled agency operating until late March. The ruling comes just days after the judge had rejected an initial $1 billion loan request made by a federal control board overseeing the U.S. territory's finances. The judge had said officials did not provide sufficient evidence proving Puerto Rico's Electric Power Authority needed the money, so the board submitted a revised request for $300 million on Friday. Hours before the judge approved the request, Gov. Ricardo Rossello maintained that the company still needed a $1 billion loan to keep operating in the months ahead. "There's no money," he said. "We're in a precarious situation." Neither the board nor government officials immediately responded to requests for comment after the loan was approved. The board said in a previous filing that it plans to request more loans in upcoming weeks. The initial $300 million would come out of the government's general fund, but officials needed permission from the court to do so given that the island is undergoing a bankruptcy-like process to restructure a portion of its $73 billion public debt amid an 11-year recession. Rossello stressed that the U.S. territory is running out of money and also needs a separate, billion-dollar loan that U.S. Congress approved in October for disaster recovery. Federal officials said in December that they were withholding the funds because they believed the government still had enough cash available. The federal control board recently warned that Puerto Rico's power company could see a $1.2 billion loss in revenue in the first six months after Hurricane Maria, which hit on Sept. 20 and destroyed two-thirds of the power distribution system. Nearly 250,000 customers remain without power more than five months after the Category 4 storm. On Sunday, government officials announced that they were reducing the power company's operating reserve by 450 megawatts to help save $9 million a month. They said customers would not be affected but warned it could destabilize a power grid heavily damaged by the hurricane. The power company is $9 billion in debt, and Rossello announced in January that he plans to privatize the company in the next 18 months.